Bluetooth Rearview Mirror: Accident Waiting to Happen or Safety Device? At first blush, this seems like a really good idea. But then I started thinking about it, and I’m not so convinced. I mean, your standard rearview mirror simply shows you what’s behind you, right? Do you really need the screen to change so you can make phone calls and get a map? Sure, it cuts down on the number of devices you’d need in your car, but I can’t help seeing this as something of a bad idea nonetheless. 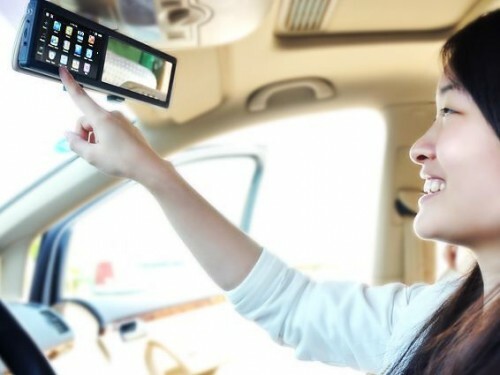 All you need to do is connect your Bluetooth-enabled cellphone to the rearview mirror. It contains a microphone and speakers, so you can have hands-free conversation while driving. It also features a SiRF STAR III chip and Centrality Atlas 4 Dual-Core 500 MHz processor, so GPS navigation is a snap. And if you’re stuck in traffic (please do not use this feature while the car is moving!) you can play music, video and touchscreen games. I would also assume you’ll want to keep a fairly sizable stock of lens wipes handy, because with all that touching your mirror is going to end up virtually useless for seeing traffic behind you. The touchscreen measures 4.3 inches wide (resolution is 480 x 272 pixels) and will fit over your regular rearview mirror. It also comes with a 4GB microSD card for storing maps or pictures. If you simply must have one, you can pick one up for just over $100.00 US.